iSafeBox is your personal "Safe Box" for critical files and data on iPhone/iPad. iSafeBox protects your files, photos, contacts, passwords, and personal information using very secure encryption. Master password is required for accessing iSafeBox. 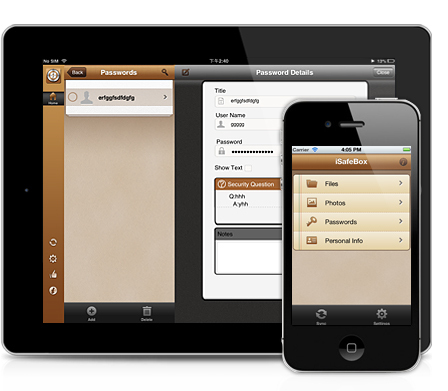 All files, photos, passwords, and personal information are encrypted and securely stored. Import files and photos from Camera Roll, iCloud, Dropbox, Google Drive, Email, and other Apps. Export files and photos to Camera Roll, iCloud, cloud drives, email, and other Apps. Powerful file manager for your local files, including adding, sorting, renaming, deleting files/folders. Open supported files, including: PDF, Doc, Excel, PPT, image files, MP3, TXT, video files and more. Export your files and photos. Export your password and personal information. With its simple interfaces, iSafeBox provides the easiest way to protect your critical files and data on iPhone and iPad.